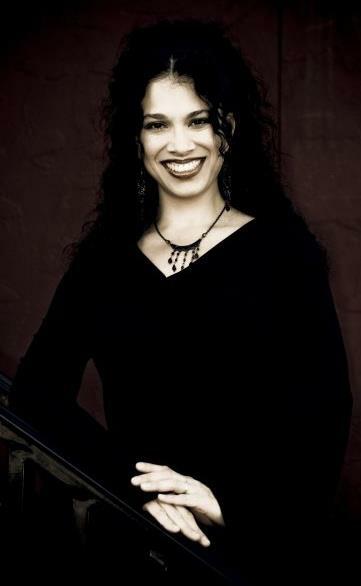 __It is with great honor that I introduce talented author Elizabeth Mueller to my readership. Elizabeth not only can write, but she is quite the artist, and agreed to do my signature Character Therapist sketch (found on my website). In fact, she illustrated her debut novel, Darkspell, herself. Winter Sky believes she is everything ordinary . . . until she is kissed by Alex Stormhold.As seer of Stormhold Coven, Alex is sworn to be Winter's protector against the darkness that hunts her. Violently thrust into a magickal realm she always thought impossible, she stumbles upon a disturbing secret of her own. I started reading Darkspell in bits and pieces as Elizabeth posted chapters on Wattpad. I found myself clicking on Wattpad at all hours of the day, during work, when I got home and was supposed to be feeding my child, etc. Finally, I emailed her and said I wanted to influence for her...for her to please send me the entire book! What I liked best about it was that it's a clean read, much like Twilight. There's no gratuitous scenes, but yet a sweet, compelling romance for all ages. Now, it's nothing like Twilight in that there are no vampires, but it is a paranormal, young adult romance, just with a different spin. And that was refreshing! Elizabeth's story world is unique, a coven that wields magick. (Don't think Wiccan or witches or anything like that.) And they can do all sorts of cool things. Winter, being unfamiliar with how to "bend time" and other neat tricks, serves as the reader's avenue of introduction, but the reader never gets bogged down in the detail, because Elizabeth writes to suspend disbelief. Winter's romance with Alex is swoon-worthy. His brother is pretty magnetic, as well, (as Winter discovers) and the result is a great love triangle of sorts. Seriously, I wasn't sure who I wanted her to end up with, because they both had their strong points in their favor. As a therapist, I appreciated the backstory angle Elizabeth gave Winter, as her tragedy haunts her very realistically. As a lover of suspense, I felt an impending sense of "what the heck's going to happen to Winter?!?" the entire time I read the book. How was she going to fight this darkness (which was done very well, I might add)? Does she have a magick power of her own to help her? What's so special about this girl? One lucky commenter will be wondering too! Elizabeth has graciously agreed to give away an e-book copy of Darkspell to one of my readers, so please be sure to click on "follow" to the right if you haven't already done so. Giveaway will run through Sunday. US residents only. Don't forget to connect with Elizabeth on Facebook, Twitter, Goodreads, Smashwords, Amazon, and her blog. Let's Analyze: Why do you think the world has become so enamored with paranormal books? With great writers like Elizabeth, it's not a hard question, exactly, but I think it goes deeper. What is it about our own world that makes us yearn for release to another? I really liked the Story I have been so wrapped up in BD1 and reading my Twilights to get read for the night I had not been paying much attention to my other Paranormal stories and Darkspell did that for me. I had orginally read the first couple of chapters from the author's website and she generously allowed me to read the book for review. First all one thing I really loved about this book is the drawings in between chapters that gave the book a different feel that the other paranormal books don't have. Two I did read this book as a E-Book however I will be getting it as a paperbook just because of the drawing and also because I want my niece to read it I know she will love it so much. The Story of Winter and Alex is a wonderful innocent story of new love and step's a Winter is willing to take to keep that love. This wasn't even about a physical attraction more of emotional love that is sweet and pure and what falling in love with some should be about. I see Winnie as a strong girl that has lost her father at a young age and is the big sister in the family and instead of teens that can't stand their lil brothers she does get fustrated with them but loves them whole hartedly. This was one of those stories where you want peace and quiet just so you can read it with the drawing and also the wonderful writing of Elizabeth Mueller I could see in mind what is going on in the story and the end story was very good I was pretty suprised by it myself and was "Ok I didn't see that coming!". I don't want to give away any spoilers just because this is a book that you have read for yourself and enjoy Winter and Alex story. I cannot wait to see more stories from this author. That's one word I can think of that sums up this book. Elizabeth Mueller takes us on a journey where nothing is as it seems but one thing . . . a passion so intense it compels us onward. Winter Skye is a normal teenager with normal aspirations and dreams; until Alex Stormhold literally walks out of her dreams and into her life. Her world is turned upside down as she struggles to find out about her past, her present, and her future while desperately trying to hold on to the one person she loves more than anything. But will her love be enough? The emotional roller-coaster, the dangers, the overwhelming love and desire give this book all the elements of a great novel to keep readers turning pages to find out what happens next! As a clean YA Paranormal Romance this book will not disappoint and is appropriate for readers of all ages! What more can I say?! Fabulous job Ms. Elizabeth Mueller and I can't wait to read more from this new breakout author!! Warning: This book is MAGICAL! My Thoughts/Review: Winter is your average teen excited about starting her senior year. She keeps having this same dream about a boy she meets and she can't seem to get him out of her mind. All she knows is if he were real she would be with him and enjoy his warmth and protection. Then Winter gets new neighbours and her mother is just dying for her to meet them. When she arrives at their house to deliver cookies she thinks she has died and gone to heaven. She sees the boy in her dreams! She stares at him and asks him if it is a dream and he laughs and says no. Elizabeth has weaved a story that will tug on your heart and having you yelling and screaming and crying all at the same time. This is a story of love, faith and sacrifices. Winter will have to face some tough choices and make some serious decisions but she will also have to learn who to trust. She will be tried and she will be betrayed but in the end love conquers all because through that love she will help her family find the peace they have been looking for. This story will tug on your heart and have you rooting for Team Alex! Alex wants to do what is right but everything right is not always what it seems. He will love, lose and win all in a span of time. Hearts will be broken and friendships will end but in the end everything will come together and you will be left speechless and breathless wanting more. Memorable Quotes: Alex talking to Winter "Do you realize how hard it is to stay away from you? All I do is think about you." Mueller, Elizabeth (2011-10-27). Darkspell (Kindle Locations 1694-1696). TreasureLine Publishing. Kindle Edition. Advice: This is a MUST READ! It will leave you breathless! Darkspell is one of those guilty pleasure books that keep you turning pages. Elizabeth Muller, tantalizes the reader with healthy doses of romance, mystery and magic unlike any other. The perfect read for anyone 13 and up who wants to curl up with a good book . Elizabeth Mueller had me hooked when I read the first chapter on her website a couple weeks before this book even came out. DARKSPELL is an amazing story of magical romance and terrifying evil. Every time I thought I had figured out something in the book, something happened to contradict what I was thinking. Mueller kept me turning pages until the very epic ending. Despite everyone blushing and looking through their eyelashes, I truly enjoyed this book. Winter's journey from plain ordinary girl to girl in love to girl with special powers was breathtaking and heartbreaking. The way Winter and Alex connected, on so many different levels, is what most of us spend our whole lives searching for. The betrayal near the end tore my heart out. Oh how could you, _____?? And the animalistic behavior of the boys after Winter's change was surprising; I've never seen something like that before. A very well written novel, DARKSPELL is for anyone who loves paranormal romance, mystery and action. I will be highly recommending this to all of my friends. Warning: This book will definitely cast a magick spell on you !!! Cover-Speak : OMG !! I just loved this cover . Yeah yeah i know i say that for all the book covers that i come across , but this definitely is truly magnificent !!! I really loved the background , for me it mostly symbolised darkness but then Alex ( the lead ) guy in the book is like the light to get rid or to destroy the darkness around . Darkspell is the story of 17 yr old Winter who dreams about a mysterious boy and longs to meet him in reality , atleast thats what she wishes for . And then one day just out of the blue her prayers are answered and she meets the tall , strikingly handsome Alex . But what Winter does not realise is that this fated meeting with the boy of her dreams would ensure that her life would never be the same again . Thrust into a world of unending possibilities , Winter will have to make choices and decide who is trust worthy and who is not . Who/what is worth fighting for and who/what is not . Secrets will be revealed and new discoveries would be made . All this coupled in with romance makes this book a thrill filled ride ! 1) Magic as a base : Honestly , i hav'nt read a lot of magic based books after the Harry Potter series , so this book was like a wave of freah air for me . Its not also like i hav'nt read books about witches and wizards , but Darkspell is sooo totally different from all those stories . I really cant get into the ' different ' part here because i may give away spoilers , which i dont want to . But once you read the book you'll understand the difference in those books and Darkspell . 2) Story build-up : Another compelling feature of this book was the technique of story building used by the author . To put it in simpler terms , the story starts off on a very happy yet mysterious note . I mean as a reader you cant help but ask yourself " What on earth is going on ??" Winter is hopelessly in love with the boy of her dreams but she is'nt sure if her feelings are reciprocated or not . Then we have Alex . a mysteriously handsome young boy who looks at Winter in a way that is sure to melt your knees , but Alex seems conflicted and masked and Winter is'nt sure why . As the reader dwells further into the story , everything starts making sense and things start falling into places . From her on the book just turns into a scare ride and is bound to give you unexpected twists and turns . Like me if you start making assumptions while reading thiss book , be prepared for a massive 'self trip face plant ' !! 3)Characters : What starts off as a small character based story suddenly turns into a huge star cast !! Confused ?? Dont be ! 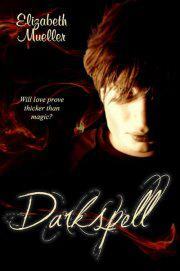 If Darkspell was to be made into a movie , it would be totally amazing !! That being said , it would be even more amazing to see who gets to play Alex !! Totally and undoubtedly loved him . He is sweet , strong , possessive ( in a heart melting teary eyed way ) and magical ! A perfect boyfriend if you ask me ! Winter on the other hand was completely shocking . I mean there were times i was disappointed with her behaviour and at times irritated and then she would manage a 360 and i would suddenly like her ! To be honest she got me confused ! Parting thoughts : This book was a heavenly reading experience . Whats heavenly you ask ?? Heavenly is when you have many different kinds of emotions wrapped up in one single element with equal quantities ! Darkspell is definitely that kind of book ! The romance in this book being the talking point , but one cant help but ponder on questions like is love and hope enough to make one whole ? Does meeting the special someone who is meant for you really enough to change your outlook towards life ? How far will you go and what sacrifices are you willing to make for those who matter ? Lies spoken for the safety and well being of someone are actually lies or not ! Darkspell is definitely a ride into the unknown and is bound to get you hooked till your questions are answered . Recommended for readers who enjoy romances with a graceful sprinkle of Magick !! Winter Sky believes she is everything ordinary . . . until she is kissed by Alex Stormhold. As seer of Stormhold Coven, Alex is sworn to be Winter’s protector against the darkness that hunts her. Violently thrust into a magical realm she always thought impossible, she stumbles upon a disturbing secret of her own. Darkspell doesn't fit into a typical YA genre box. As a matter of fact, it's one of the most original books I've read this year. A richly woven drama unfolds as young Winter Sky meets two handsome and mysterious neighbors, both fighting for her affection. But one boy, the boy of her dreams--literally-- has already won her heart. But in short order her life is turned upside down as she enters the Stormhold world, a coven of powerful magic users (I'm hesitant to use the word witch/wizard here. This is really something very different.) where she is being hunted by the Shadoweaver. Suddenly everything is in jeopardy as she searches for her gift and fights to keep the boy she loves. Elizabeth Mueller gives a great story, full of normal teen angst without tipping the scales to be annoying, she keeps us guessing, dropping nuggets for us throughout the story, but never tipping her hand. Combine that with the fantastic use of illustrations that give it almost a graphic novel feel as we read, and this is easily a five star read. I can't wait to pick this up in paperback and you should too! Mueller is a great addition to the YA world and I can't wait to see what comes next from this talented writer!